10 Nonfiction Reading Passages, each with information about Christmas in a different country. 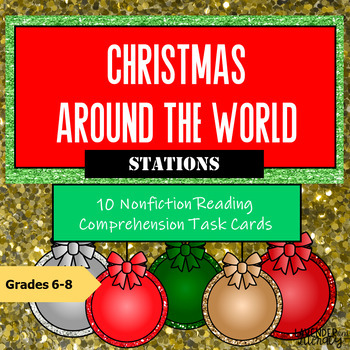 Students will read about Christmas traditions, customs, and celebrations in Italy, Germany, Canada, South Africa, New Zealand, China, Spain, Brazil, Jamaica, and China. Each task card contains a set of 5 text-dependent, Common-Core Aligned open-ended questions. Perfect for stations and around-the-room games!